Thermal Paper is commonly used in Point-of-Sale, Cash Register, Credit Card Terminal, Kiosk, Fax, Pay-at-the-Pump, Medical, Casino/Gaming, Self Check-out, Mobile Printer and many others. Thermal Paper differs from bond paper in that the printer doesn't need a ribbon to image the paper. Another advantage of thermal printing is that there are less moving parts which translates into fewer breakdowns. Additionally, thermal printers are much faster than impact printers. commonly by a dynamic source of heat like a thermal print head. This is accomplished by a row of very fine dots that are heated and cooled as the paper is transported across the print head by a step motor. The density of the image can be measured by how dark the image is when given different levels energy. See the graph below that shows the activation curve for a low, medium and high sensitivity papers. The darkness or density is measured bya Densitometer and paper must be fully imaged or reach a 1.2 density ready to attain the optimum image life for that grade. Substrate - Paper or synthetic base sheet that comes in different calipes that the coatings are applied to. surface that the thermal coating will adhere to. stem that will image when heat is applied. Top Coat - A this clear layer of PVA that seals the active coat and provides environmental resistance and a longer image life, typically used in harsh or stressed environments. Anti-static coat - This coating is applied to the back side of some papers, but primarily used as an anti-static coating on synthetic base sheets like Polypropylene based thermal grades which can generate or draw static and can burn out electronic components. 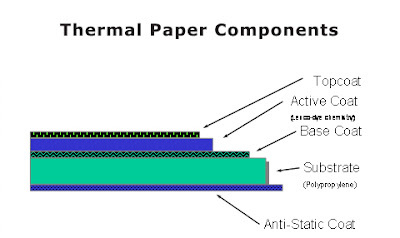 I hope this gives you a basic understanding of the construction of thermal paper. Please keep in mind as you are working on your various thermal paper projects that we carry a wide range of thermal roll papers that are made to OEM specifications. We can also produce custom printed paper rolls for just about any special application you might have. If you have any questions or you would like to discuss a specific topic please contact us for more information.